Featured Blog: What is a CSF Leak? “So, I wasn’t running around sharing with everyone that I had this medical condition when it happened. My friends who were taking care of me knew, my co-workers knew, my family knew, and that’s about it. I was on the fence about really going into detail here, because really…I am doing much better! And I feel really lucky that it’s something that is healing, that it wasn’t something life threatening, and that I have been able to gain my quality of life back (knock-on-wood) in a relatively short amount of time. But, this experience is going to be tied to how I approach my first year of teaching. It has changed how I value being able to have the ability to do my job, how I value my life, and the lessons I have learned will effect this little adventure I am embarking on. Also, it IS a rare and largely unknown condition. And if I can help raise some sort of awareness, in case someone out there has a similar headache that isn’t getting diagnosed correctly and is suffering ( doctors and friends/family suspected migraine, brain tumor, meningitis or aneurysm before the correct diagnosis appeared), they know about this possibility. This condition, while rare, is misdiagnosed and thus probably more common than we think. And the misdiagnosis causes more problems, last pain, and financial cost than it should. In fact, I read a study that 0% of cases were diagnosed properly in the first visit to the E.R. WHA!!! And I read numerous stories about people having to fight for themselves at the doctor, that there WAS something wrong, and it wasn’t just “stress” or “anxiety” related. I feel lucky that I had a mom who heard about George Clooney (he’s a leaker! More about this in a later post.) and told me about leaks, a general practitioner who believed my symptoms didn’t add up, and a neurologist who was informed about CSF leaks! Well, we all have fluid floating around our brain and spine, that serves as a protective barrier for our thinking cap. And holding this fluid in is a relatively strong tissue called our dura, which is around our brain and spinal region. Well, apparently, my dura had a problem, and tore somewhere. This caused my cerebrospinal fluid to leak out. Which then, caused my headaches because my brain was sitting lower than it should be. Typically, people get these leaks after a spinal tap/lumber puncture, after some sort of trama, or an epidural. I had none of the above (although I have searched every moment of the weeks leading up to my symptoms for a reason…and so far…I did dance super hard two nights before. Could I have danced to the point of causing a leak? Of course I would!). Thus, mine is spontaneous, it just happened. I’m a lucky one! In my late 20s, I became crippled with debilitating dizziness and headaches. I visited eight doctors—and no one could figure out what was wrong with me. A decade ago, I lived in a beautiful apartment near Avenue Road and Davenport, an elegant one-bedroom that contained most of the frothed-up dramas of my highly decorative 20s. I did up my living room in blue Albrizzi lacquer, with a deep feather loveseat upholstered in fuchsia velvet. It was honeytrap decor: my place wasn’t so much a party apartment as an after-party apartment. I filled my fridge with prosecco and my medicine cabinet with designer drugs and my closet with $1,000 dresses I had no business buying. I spent most nights waiting for a guy who usually called at midnight. I would lie on my sofa, with my hair done, smoking, tingling. I would sit in front of my computer, drinking, vibrating. If he didn’t call by 12:30, I would fall asleep on my stomach, so as not to squash my hair. In the morning, clumps of hair would come out in the shower, as if shearing the plane for another day of hope surging up and dying on its stem. I was dizzy all the time. At first, I thought I was just sick with longing. Then one night, sitting by the non-ringing phone, it suddenly felt like my hands and feet were covered in pins and needles. I walked to the emergency ward at Mount Sinai. In the pantheon of medical symptoms, there are those that doctors will immediately mark as stress-related, and thus lightweight—don’t complain of dizziness, or ringing ears, or headaches, or vertigo. If you are an overworked, nerve-wracked, single Jewish newspaper editor kitted out for a bad affair, walking into emergency at 1 a.m., you’ve got your cultural profile working against you. The ER doctor told me to take a holiday. Try some yoga. I saw eight doctors in Toronto. One said I might have an inner ear issue. Another thought I was hyperventilating without knowing it. A third put me on steroids. Most agreed my symptoms were “stress-related.” Incredibly, nobody looked at my brain. Over the next few months, I left my apartment only for medical appointments. I spent the rest of my time helplessly supine, feeling like the top of my head was being torn off with nautical rope. Every waking moment I could keep my head up I spent in front of my iMac, trolling through obscure neurological journals, reading papers I could barely understand. I narrowed it down to the most likely illnesses—multiple ­sclerosis or a brain tumour—but neither seemed right. 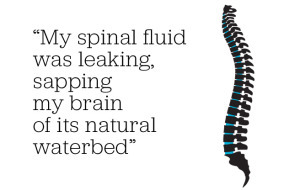 One day, I found a syndrome called spontaneous ­cerebrospinal fluid leaks, something so rare most neurologists have never seen a patient with it. I read the symptoms and a huge flashing YES lit up behind my eyes—I knew I had found my illness. It wasn’t anxiety. It was faulty tissue. The sheath of my spinal cord, the dura, was tearing, and my spinal fluid was leaking out, sapping my brain of its natural waterbed, the thing that kept my grey matter from sinking into the occipital bone. The first doctor to properly check the pressure of my spinal cord found it to be about a third of what it should be. The next few days were blurry and dreamlike. My family came in from Montreal and whisked me back there for treatment. Everything I knew in life blew away like fairy dust. I underwent 14 spinal cord procedures over two years, and they all failed. First, doctors in Montreal sprayed patches of my blood onto parts of my spinal cord, ­hoping the resulting clots would patch the holes. When those didn’t work, doctors at the Mayo Clinic in Minnesota used surgical glue to staunch the leaks. 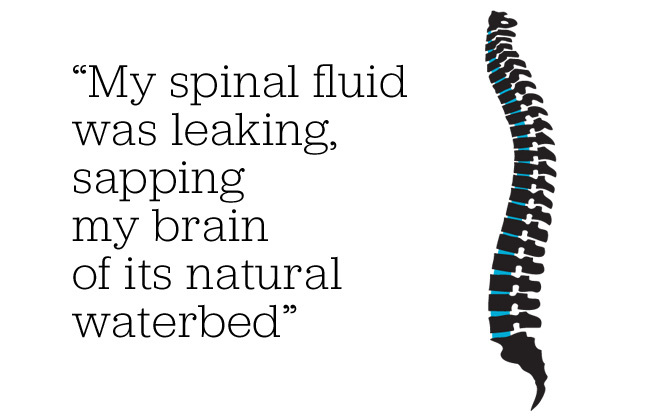 For days at a time, catheters injected saline into my spinal cord, a feeling so ­nightmarish I developed a phobia of needles. I took his advice, cancelled the surgery and tried to let myself heal. I spent the next 18 months in a declined bed, my head lower than my chest, to give my brain the suspension it no longer had naturally. I wore a corset to keep to keep my torso bound and my spine squeezed tight. For two years after that, I was wheelchair-bound, not knowing whether I would walk again. Death was always near, an aneurysm just a sneeze or a bad pothole away. By my late 30s, my long-standing leaks began closing up on their own, and life was slowly returned to me. I carefully, incrementally, went back to work, got married and, two years ago, my husband and I had a daughter; I am currently pregnant, at 41, with our second baby. I do have relapses. I disappear into my home, into the pain, and come back to the world a month or two later, with the rawness of a recluse returned to sunlight, but also the strange clarity that deep illness can provide. I now live with new caveats, things I tell myself regularly: don’t get too cocky; illness is always right around the corner for you. Don’t you dare waste your life—that’s not your kind of freedom.